Hello! I’m Abby, a third year UC Berkeley undergraduate majoring in Integrative Biology and Geology. I am broadly interested in the spatial history of life and geologic features. Why are things where they are? More specifically, I am interested in historical biogeography of plants and how geologic factors can influence distributions. 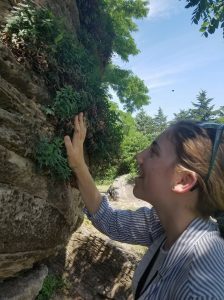 In the Rothfels Lab, I am working on a project looking at how polyploidy as a mechanism of speciation affects niche breadth in the xerophytic fern, Astrolepis. I hypothesize that observed patterns of apparent niche broadening through allopolyploidy could be a result of differing niche shifts among multiple origins within the polyploid complex of Astrolepis integerrima. My plan is to combine molecular approaches with niche modelling to first identify more origins within the complex, then model species distributions using both climate and geologic data. I also have a background in public education and informational graphic design. I recently worked on a project improving and updating the mineral displays in the Department of Earth and Planetary Science, producing new content and signage as well as curating mineral specimens to be displayed. I love botanizing, geologizing, and hiking. I also enjoy making maps and screen printing.